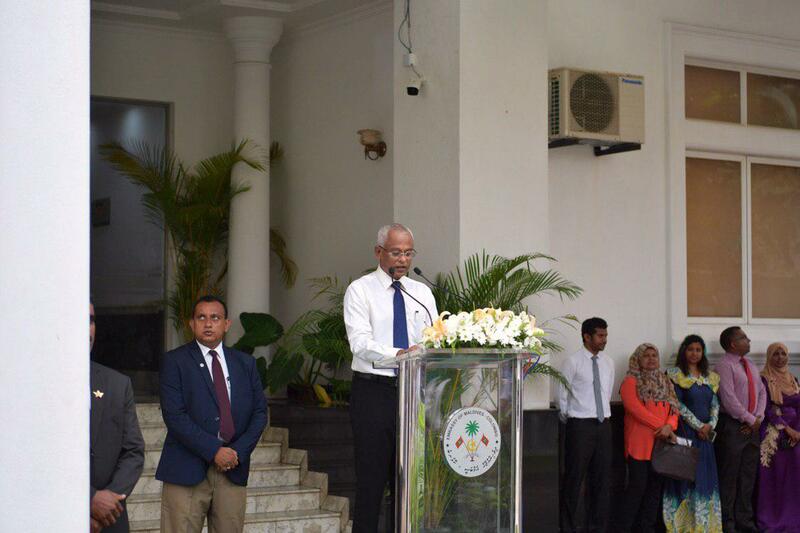 President Ibrahim Mohamed Solih announced this evening that Maldivians residing in Sri Lanka will be eligible for Aasandha healthcare insurance, from April onwards. The President made the announcement this evening whilst meeting with the Maldivian community in Sri Lanka. His Excellency further noted that the administration is working towards providing Aasandha healthcare services to the Maldivian community in other neighboring countries as well, as part of this administration's efforts to help Maldivians living abroad. Moreover, The President noted that this administration has eased the student loan schemes, in response to requests made in previous visits. Highlighting the longstanding historic relations between Maldives and Sri Lanka, the President noted that Sri Lanka was the first country that helped the Maldives to gain independence, and that the Maldives' first overseas embassy was established in Sri Lanka. Expressing gratitude for Sri Lanka’s manifold assistance to the Maldives, the President noted that Sri Lanka has greatly contributed to the development of the Maldives' educational system — especially towards establishing an English medium of education. Moreover, he noted that Sri Lankan aid and cooperation has greatly contributed to the enhancing of Maldives' healthcare, infrastructure and overall economy. Additionally, he thanked the Sri Lankan government, its leaders and the citizens of Sri Lanka for always supporting the Maldives in its fight for democracy. The President also stressed that the key objective of this administration’s foreign policy is to safeguard our independence and sovereignty, and thereby ensure the country's security. He appealed to Maldivian expatriates in Sri Lanka to always embody Maldivian values of discipline and decency in their conduct and to strive to ensure that Sri Lankans retain their positive view of Maldivians. During the three-day visit, President Solih will meet with President Maithripala Sirisena on a one on one basis, to discuss further avenues to strengthen bilateral ties.